Evidently, Spain has long given up the Peseta, therefore, the effect of the Catalonian referendum upon exchange rates will be localised within the Euro. Given that the single currency brings about de facto insurance to a national idiosyncratic risk (c.f. Mundell 1973), it is possible that the Euro will show relative ambivalence to any possible announcement at around 5pm BST today. The price behind the Euro is still derived primarily from the supply and demand for the currency, however, the understanding behind the value of a currency union must be based upon its cross-border nature. In effect, while the Catalonian referendum might credibly be of national significance, on the Eurozone grand stage, any national effect resembles only a regional shock. The effect within Spanish bonds and equities has certainly been felt. Bonds, for example, are paying a higher yield, reflecting the risk and uncertainty that a Catalonian secession from Spain would create. However, overwhelmingly, these national indicators and markets have managed to remain calm and price the risk modestly. Equities of banks exposed to Spain and Catalonia have been more volatile. These banks have even felt it necessary to insure against a Catalonian secession by insuring their ability to physically relocate and, in the meantime, by adapting their legal headquarters. Whilst our analysis of Carles Puigdemont highlighted his infatuation and belief in Catalonian independence, the constraints that the region’s President faces may precipitate a more moderated response during his speech this afternoon. If the actions taken by Puigdemont are moderate, meaning anything short of a declaration of independence, then I expect a comparable calm within international markets. If Puigdemont pursues a democratic (or bureaucratic/diplomatic) and conversational approach then the risk that is priced into the market reflecting the uncertainty surrounding the Spanish and Catalonian economies will be partially priced out – allowing the Euro and affected Stocks and Bonds to appreciate. Open democracy, conversation and mutual agreement lead to more gradual, predictable, and stable processes, rewarding bonds, equities and assets tied to both economies with more value. Therefore, the effect upon Catalonian and Spanish equities and bonds will be stabilising; lowering the yield on bonds and raising the price of equities and assets. However, in the more unlikely, yet plausible, scenario where Carles Puigdemont achieves and submits a signed declaration of independence then further risk will be priced into the market. Capital will leave the areas most affected by political risk, namely Catalonia and Spain, as uncertainty deteriorates the investment environment. However, given that neither Catalonia nor Spain operate using their own, unique, currency, it must be considered whether the common currency, the Euro, will feel the damage. Whilst the spill over from Catalonia to Spain is inevitable given the analysis within the preceding article, the significance of Catalonia to the Euro is less certain. Accounting for a little over 2% of total Eurozone GDP, Catalonia is not critical to the output and performance of the Euro, but it is also not negligible. Moreover, the longer-lasting potential spill over effect upon both Spanish and Catalonian GDP, should Catalonia become independent and outside the EU, could be strongly negative, particularly if a tariff barrier to trade becomes effective. The fiscal significance of the Eurozone and European Union is clearly low; the European Budget contributes for expenditure of around only 1% of Eurozone GDP. However, Spain’s net European Budgetary contribution to the EU budget will be distorted and the vacuum must be filled by international compensation, or left to fall. With the prospects for European integration increasing according to the foreign policy and integration stance of French President, Emanuel Macron, political risk and fiscal reshuffling could be damaging and disparaging. Perhaps the most valuable present feature of the European Union is the world’s largest single market; free of barriers to entry and internal tariffs. The population of Catalonia as a percentage of the total population of the single market is around 1.5%. To some extent at least, the strength of the single market will be minorly diminished. However, the practical impact of a reduction in potential trading individuals will be negligible given the replenished prospect for further EU accession and an undervalued Euro, for example against the pound, spurring the competitiveness of the Eurozone. The Euro has shown moderate sensitivity to the progression of the Spanish constitutional challenge posed by Catalonia. Regarding the future, highly moderate strength will be conferred upon the Euro if the diplomatic, gradualised, path is taken. Similarly, if unilateral independence is declared this afternoon, the Euro will suffer immediately, and into the trading day tomorrow. 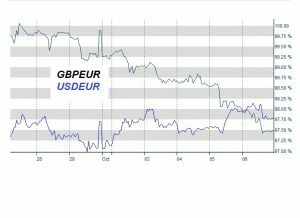 Although moderately shrugged off by the Euro, the end of trading day spike showing Euro weakness is likely to signal a sell off of Euros before the weekend Catalonian referendum on October 1st. This afternoon’s announcement should prove to be more market sensitive, particularly if the status quo is broken and Puigdemont claims Catalonian independence.